MECHANICSBURG, Pa. - May 20, 2016 - Lance Dewease exited his car to loud cheers from the Pennsylvania Posse-favored crowd after he dominated the final 15 laps of the 25-lap feature to claim the World of Outlaws Craftsman® Sprint Car Series victory at Williams Grove Speedway on Friday night. Dewease, who passed fellow Posse driver Greg Hodnett for the win, became just the second non-Outlaw driver to capture a checkered flag in a series race this year, joining Kerry Madsen who swept the Eldora Speedway races earlier this month. 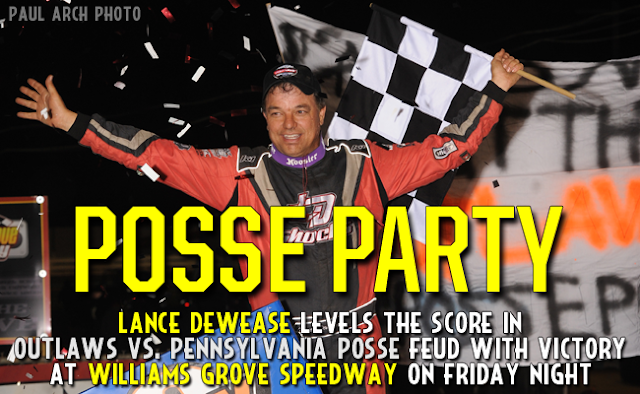 "It feels great [to win at Williams Grove]," Dewease, a Fayetville, Pa. -native said. "It's been a long time coming here, and like I said, I can't thank these guys enough - they have done a great job over the winter getting prepared for each race. We're only going to run about 30 shows, which suits me and suits them, and we have to stay prepared and fresh for that. "A lot of guys win at 50 - I never said this was a young man's sport. It's a blessing to drive this thing, and I say that every time. I am just very blessed and honored that they gave me a shot and I can't thank Donny and Linda Kreitz enough. Posse fans were especially jubilant as second-place finisher Hodnett held off Thursday night's winner Donny Schatz to give the Pennsylvanian drivers the sweep of the top two finishing positions. "We just came up a little short," Hodnett, a Spring Grove, Pa. -native said. "Lance [Dewease] and those guys have been good and I just needed to do something different - not sure what. "The guys did a good job with the car, I just let them down." The feud kicked-off early in the night when the Outlaws and Posse split the quick-time awards with Joey Saldana fastest in the first flight and Hodnett fastest in the second. The back-and-forth battle did not end there, as the two fierce rivals split the victories in the heat races evenly with the Outlaws and Posse each scoring two apiece. For the second night in-a-row, the Outlaws were aided by the luck of the dash invert draw, as Saldana remained on the pole-position following an invert of zero. Unfortunately for Saldana, he was unable to hold off Hodnett in the six-lap race, as the Posse driver claimed the victory and the pole for the feature. When the green-flag fell for the feature, Hodnett, in the Lelands.com/Eagle Steel No. 27 jumped out to an early lead, as second-place starter Saldana slid back. Daryn Pittman, who started fourth, quickly moved up to the runner-up position and applied pressure on Hodnett for the top spot. Towards the halfway point in the race, Pittman's car started to fade as No. 69K Kreitz Oval Track Parts/Sharman Builders car of Dewease quietly worked his way around the Outlaw driver for second. Dewease, who started in the third position, bided his time in the early stages of the race and then turned on the speed in the latter half to challenge Hodnett for the lead. Once Dewease got to the rear bumper of the leader, he was able to muscle his way around Hodnett for the top position with only 15 laps left in the feature. The Posse driver turned on cruise control for the remaing laps, as he maintained a comfortable lead over Hodnett, who had his hands full with the No. 15 Bad Boy/Chevrolet Performance of Schatz. Hodnett held off Schatz but was never able to challenge Dewease, who dominated the final 15 laps to capture the checkered flag on the opening night of the Morgan Cup weekend at Williams Grove Speedway. "I had to move around and that's how I caught [Greg Hodnett]," Dewease said. "Greg was just kind of sitting there, and when you're leading it's so hard to move around, so the guy in second has all the advantage. "Greg was pretty good all night, we just got to him before it could rubber up and got around him on the bottom. At the end I was struggling a little bit in the lapped cars - I didn't know if Greg could do anything outside of the rubber, so the last few laps I just made sure I didn't get right on somebodies bumper." For the second year in-a-row, Hodnett led laps early but had to settle for the runner-up position. "I was trying to run the top down here and kind of float around and it was working okay, just not quite good enough," Hodnett said. "Lance and those guys have been doing good and they deserve to win. Hopefully we get our car better and maybe contend with them." Winner of this event in 2015, seven-time World of Outlaws champion Schatz scored his second podium finish in two nights after being barred from a top-three finish since USA Raceway on April 18. "Third is not where we wanted to be, we wanted to win the race," Schatz said. "We weren't good enough to win the race, Lance was awfully good and Greg was good. 25-laps was what it was, maybe tomorrow night will be a little bit longer and we will have a little better shot at it. "The guys did an awesome job trying to get me a better car than what we had earlier in the night. We got ourselves qualified well, that's so important now. We're just going to work hard tonight and come back tomorrow and be better." The World of Outlaws Craftsman® Sprint Car Series wraps up the weekend action at Williams Grove Speedway with the prestigious Morgan Cup on Saturday night. For more race information and ticket purchasing options, visit: www.WoOSprint.com/Williams-Grove. RACE NOTES: Lance Dewease becomes just the second non-Outlaw driver to win in 2016...Brad Sweet finished outside of the top 10 for just the third time all season...Joey Saldana ties Daryn Pittman for most quick-time awards this season at five. CONTINGENCY WINNERS - MSD Ignitions ($25 cash): Tim Shaffer; MSD Ignitions ($50 cash): Donny Schatz; Penske Shocks ($50 cash): Donny Schatz; JE Pistons ($50 cash): Danny Dietrich; VP Racing Fuels ($50 cash): Shane Stewart; Edelbrock ($50 cash): Ryan Smith; Comp Cams ($50 cash): Brent Marks; Morton Buildings ($50 cash): Aaron Ott; Cometic Gasket ($50 cash): Brent Marks; Super Flow ($50 cash): Brent Marks; Craftsman/Sears ($100 cash): Greg Hodnett;KSE Racing Products ($100 product certificate): Aaron Ott; Comp Cams ($50 product certificate): Lance Dewease; JE Pistons (Set of Rings): Jason Sides; JE Pistons (Set of Rings): Jason Johnson. SEASON WINNERS: ); Donny Schatz - 6 (Volusia Speedway Park on Feb. 14, The Dirt Track at Las Vegas on March 4, Stockton Dirt Track on March 18, Stockton Dirt Track on March 19, Silver Dollar Speedway on April 2, Lincoln Speedway on May 19); Brad Sweet - 6 (Volusia Speedway Park on Feb. 13, Volusia Speedway Park on Feb. 14, Cotton Bowl Speedway on Feb. 26, Ocean Speedway on April 1, Bakersfield Speedway on April 15, Plymouth Speedway on May 13); Daryn Pittman - 3 (Royal Purple Raceway on Feb. 27, Perris Auto Speedway on April 16, USA Raceway on April 18); David Gravel - 2 (Thunderbowl Raceway on March 12, Tri-State Speedway on May 14); Joey Saldana - 2 (The Dirt Track at Las Vegas on March 3, Devil's Bowl Speedway on April 22); Shane Stewart - 2 (Arizona Speedway on March 6, Devil's Bowl Speedway on April 23); Lance Dewease - 1 (Williams Grove Speedway on May 20); Jason Johnson - 1 (Placerville Speedway on March 24); Jason Sides - 1 (I-30 Speedway on April 26). World of Outlaws Craftsman® Sprint Car Series Statistical Report; Williams Grove Speedway; Mechanicsburg, Pa.; May 20, 2016.